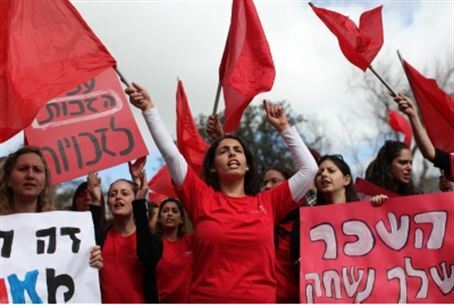 MainAll NewsInside Israel"Social Workers Destroyed Me"
Israel's media hypes up social workers' strike, misquoting a divorced father who said he opposes the social workers, ignoring other clients. Israel's largest press outlets, which have been hyping up the social workers' strike since before it began, did so with greater gusto Monday as the protesters took to the streets in Jerusalem and elsewhere. Leading items on television news programs, top headlines and multiple-page spreads in the newspapers, as well as hourly radio news bulletins, all feature the strike in a strong and uniformly empathetic way. Some of the articles are provably misleading. Headlines in the Yediot Acharonot daily and its sister website Ynet, for instance, trumpet the claim that many divorced parents support the social workers' strike because they are unable to see their children as long as the strike continues. These parents, who are almost all fathers, see their children in state "visitation centers" as a result of claims of violence that were brought against them during divorce proceedings. In fact, a large proportion of divorcing fathers blame social workers for the fact that they have to see their children in "visitation centers" to begin with. Israel's family courts tend to decide custody disputes based on reports handed in by social workers. Fathers' activists say that the workers tend to side with mother against fathers and that as a result, many kind, caring and responsible fathers are torn away from their children every year. Yediot Acharonot featured a double-spread on pages 2 and 3 in which one such father, an immigrant whom it identified by the initial D., was interviewed. The interview quoted D. as saying that the social workers' strike is preventing him from the "great joy" of seeing his children in the visitation center. However, D. told Israel National News that he had explained at length to the reporter that he does not support the social workers' strike and that he holds the Israeli welfare system responsible for wrongly tearing him away from his children and destroying his life. "Over 5,000 social workers in Israel refuse to join the Social Workers’ Union because they are notoriously corrupt and unprofessional," said D., a former consultant to the Director of the Illinois Department of Children and Family Services. "While they publish a 4,000 shekel pay-stub from a recent college graduate, they neglect to publish the generous salaries and benefits that the union bosses receive. These bosses build their entire power structure by flooding the Israeli welfare system with under-qualified social workers who drag out the suffering of vulnerable children, widows and elderly for their own job security." "If the Social Workers’ Union were to simply fire 60% of their social workers who have already proven harmful to the Israeli public, then they would find that the existing budget they receive from the Ministry of Finance will afford a more generous salary package than their American counterparts receive. I know because I have worked in child welfare most of my adult life." D., who heads a charity that helps children at risk, thinks the government should ignore the social workers' strike. "This corrupt Social Workers’ Union has already ruined my own life and profit from harming my own children. The last thing I want is the government giving them more money to ruin my children’s lives. They ignored a court-appointed psychiatrist and two experts who said it is in my children’s best interest to spend half their time with me as their father and in accordance with the law. Instead they kept me under supervised visits in their visitation center for over a year without any legitimate reasons. During my last meeting with our social worker she said, 'I do not care what the judge thinks. I will never sign off on letting you have your children for overnight visits.'" "In the USA, we never behave like that as child welfare professionals. In fact, American social workers must demonstrate superior ethics and would be thrown in prison if they were to blatantly defy a judge like that. I hope these social workers remain on strike forever so they can no longer interfere in our court proceedings and cause so much unnecessary suffering for my children." In fact, social workers deal with a plethora of problems of which divorced parents and their chldren are only one example. The elderly and infirm, youth at risk and people with special needs are suffering because of the strike . Social worker starting salaries are below the minimum wage. Headline in Yediot reads: "When will I See My Children?"